Our previous edition of Williams Sariego’s masterful Defiant Russia proved extremely popular, and it was a sad day when we sold the last copy, sometime in 2009. We weren’t able to reprint it then, and by the time we could, new technology let us give it a complete overhaul. What we have now is really, really good. Let’s take a look. The old Defiant Russia had 140 pieces, a 22x17-inch map and a single scenario. The new one brings that up to 200 pieces, a 28x22-inch map and many, many more play options. The old one came in a very small box, a size that we discontinued some time back; the new one is in our standard 1.25-inch deep box. It has a very nice new cover showing some Russians being defiant. The playing pieces are similar to those of the first edition, but some nationalities have a sharper design now. The Red Army of Workers and Peasants is the largest of them by far, with 94 of the 200 pieces (compared to 70 of the original 140). The most obvious change comes in the armor branch. The original combined the 28 tank corps that saw action in the opening months of the Great Patriotic War into 18 units. Now all 28 are present, with a broader array of drawings (not that the drawings really matter, but they do look cooler). They’re also a little slower than they were before, and don’t get all of the special powers of a German armored corps. The rest of the Red Army has changed a little, with some strengths adjusted and the addition of mountain units. There are also two NKVD units, made up of rifle divisions recruited from the Soviet Union’s security service, which are more reluctant to retreat than other Red Army units. There’s another cavalry unit, too, and the cavalry is a little faster in this edition than previously. There are a few more Germans, for use in the 1939 Polish Campaign scenario. The panzers aren’t as powerful to look at as they used to be, but their special powers to move and fight make them deadly on the attack. The Finns add a leader, Mannerheim, who helps them on the defensive. They get an additional piece to help defend the extra territory they’ve gained on the top edge of the map, and the pieces have been re-designed to look much better. Well, I like them, anyway. Romania’s army is larger, but most of its units are a little weaker than before. The game is set at corps and army level, and that makes deciding on an order of battle a little tricky as divisions shuffled between corps and army headquarters. The Romanians were even more prone to this than their allies and enemies, so their order of battle reflects their total strength pretty accurately, assigned to pieces named for active corps headquarters. But the exact strength of each of those corps varied, sometimes day to day, something you can’t really show in a game with monthly turns. New to the game are Turkey, Lithuania, Poland, Latvia and Estonia. The Turkish Army isn’t really in condition to undertake much of an offensive against the Soviets, but can defend itself very ably in the rugged Anatolian mountains. The three Baltic States each get a single weak unit, though the Latvians are tougher than either of their neighbors (relatively speaking). Poland has a pretty good army. Unfortunately, it’s no match for the Germans in the 1939 intro scenario (which is only there to teach the system quickly, ‘cause it’s going to be over quickly). We’ll give the Poles a chance to show their valor in some additional scenarios down the road: the Red Army believed Poland to be its most likely future opponent, with the Poles perhaps allying with Germany in a war of aggression against the Soviet Union. The map now stretches from just west of Berlin on the left side to just beyond the Volga on the right side. The top edge ends right around Lake Onega, and the bottom edge is just south of Kars in Turkey. The scale remains the same as the first edition of Defiant Russia, at least nominally. I’m not sure how the first edition map was drawn, but it appears to have been off somewhat in some dimensions. The distances are now correct, at a scale of 60 miles across each hex, and the hexes are nice and large. Guy Riessen’s color scheme is also coordinated with the playing pieces to make them really pop off the background. We’ll run a full map preview soon. The rules have had a thorough overhaul and re-write, particularly the first “surprise” turn for the Barbarossa scenario (it's now a complete turn, which is bad news for the Red Army - but it's a bigger Red Army so they can take it). But they retain the clean simplicity of the original, which is based on the “roll a six, get a hit” dynamic. No combat charts: line up your troops and fight. You should be able to play a complete game in just an hour or two. Daily Content and Defiant Russia debuted in 2004 within a couple of weeks of each other: when we started running these things on the website Defiant Russia was the hot new game. So it’s always had more than its share of Content love, and over the years we wrote a fair amount variants and optional rules for the game. The best of those are included in the game: an optional Soviet leader (Timoshenko), German paratroopers, the Afrika Korps deployed on the Eastern Front, Soviet Marines, Soviet workers’ militia, and some more besides. This is a package full of replay value. Plus there’s the Turkish option, which I have long wished to include in an Eastern Front strategic game. This is the sort of game I’ve wanted Avalanche Press to make for a long time. It’s easy to play, yet still follows a steady historical narrative, and includes many historically-based options that players can pursue. And it has a really beautiful map, with nice large hexes. This game is going to be fun. 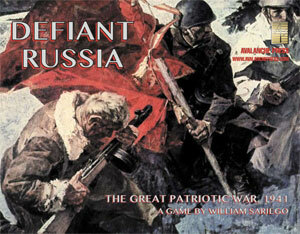 Click right here to order Defiant Russia right now!